'September 2. Happy 3rd Birthday to my little Charlotte! Wow! the time is flying by. We had a very short FaceTime conversation during the birthday party yesterday but she was preoccupied and it didn't work out so well. So this evening, after her bath, we got to wish her a happy birthday and see some of her gifts. Better yet, just got to see her playing. I finished up the pruning job that I had started at Dawn's this morning. After that, I got lucky at the St. Vincent de Paul store and found some leveling blocks for the trailer and a handheld vacuum cleaner (I will test it out and then return it before I leave if it doesn't work). I made a pot of bean soup for dinner and helped Savana cut up fruit (you know, the large boxes that you get at Costco) to freeze for smoothies later on. It was a good day. September 3. I drove to Lake Wisconsin this morning to meet up with my niece, Becky and her daughter Lizzy as we were going on a hike together. We decided on the Rowan Creek Trail not far from their house. The trail has paths that loop through the woods and along Rowan Creek just outside of Poynette. 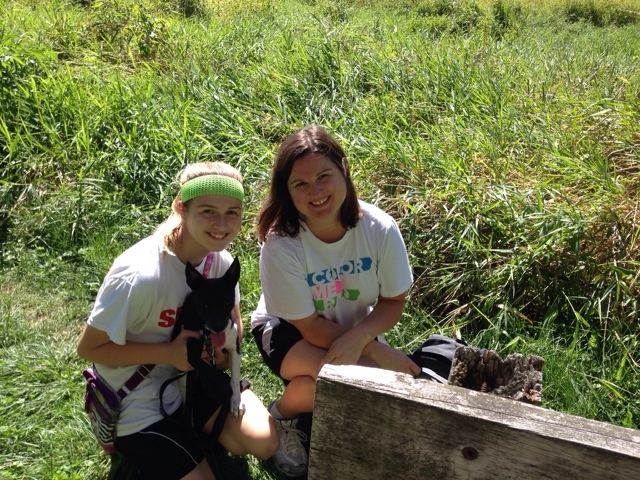 We walked through wetlands, a coldwater stream, prairie, and both upland and lowland forest. 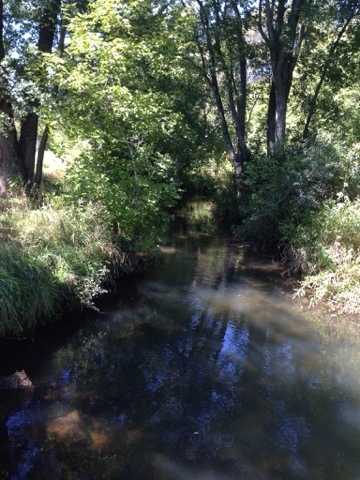 Rowan Creek is one of the better trout streams in the state, known for its brown trout population. Judging by the clearness of the water, it would appear to be a good spot for trout. 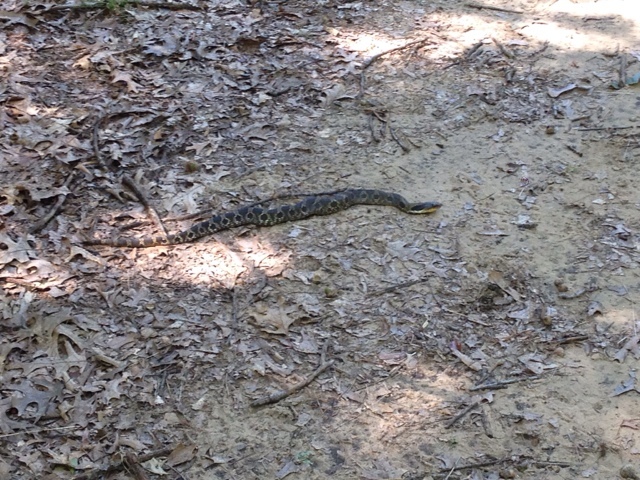 We spotted this guy along the path - he just froze and let us go by. 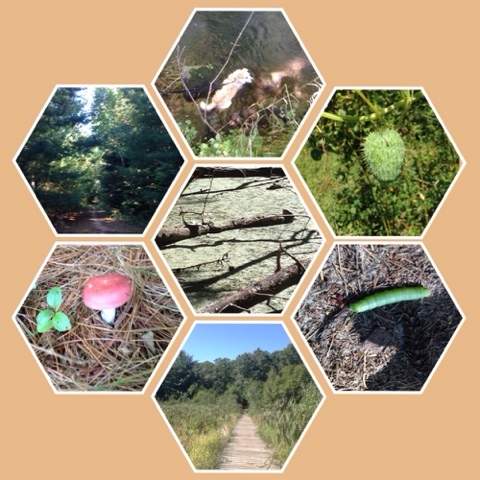 Lizzy made this collage of interesting things she saw along the way. It was a very enjoyable hike, great company, the dogs had fun, and Frisco even got to cool off in the stream. By the time we finished our hike, it was getting pretty warm and we were all hungry, so we headed in to Poynette and had a hot dog at Willie's Weenie Wagon, a converted Airstream Trailer. From there, I headed to Portage to spend the next few days with Sharon. I got there about 45 minutes early, so I drove through DQ and got a smoothie then headed to the park. I stayed in the car, parked in a shady spot and played a game on my iPhone. As I sat there, I watched a group of people gathered in the shelter across the parking lot. After watching for a while, I realized it was homeless folks or derelicts, just hanging out. Then, all of a sudden, Frisco decided to take a leap out the window, chasing after a chipmunk, and then a dog from that group of folks came to chase him and I had to chase both of them. It wasn't long and I had him back on the leash and in the car. What a naughty boy! And he's not very good at picking out spots for an escape. He certainly added some excitement (and fear) to my day. September 4. Sharon had to work today, so when my cousin Jo called to see if I would be around, I said yes and we met at Dollar Tree (my go to place for doggie doo doo bags). We had some breakfast after that and then made a stop at Wally World (aka Walmart) before saying goodbye. In the afternoon, I went over to Connie and Bill's house for a short visit before Sharon got off work. 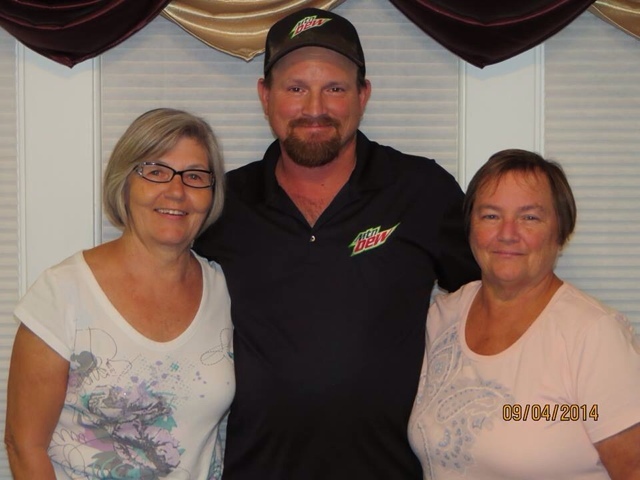 When I got back to her house, we packed up the chicken lasagna, salad fixings, and angel food cake and headed to her son, Chad's house to celebrate his 42nd birthday. 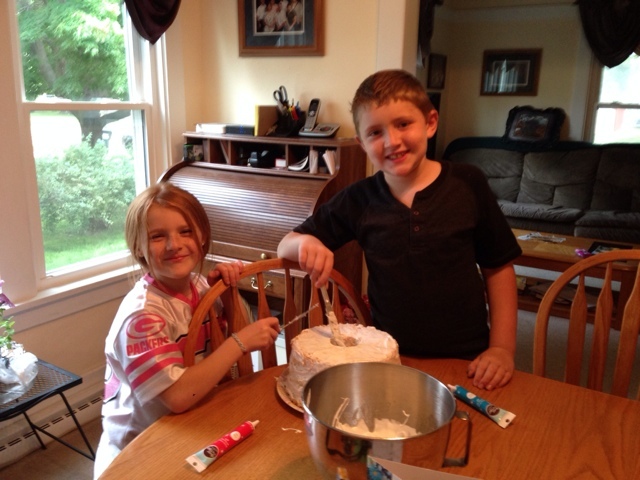 Cody and Reanna decorated the cake and we had a great visit and dinner. I'm glad I got to share this event with the family. September 5. Sharon took the day off and we managed to fill it and had a nice time doing it. We started off with breakfast at Le Croissant, a yummy bacon, egg, and cheese croissant and Chai Latte were my choice. Back home, she had to get her lawn mowed, so while she was doing that, I washed her windows on the outside. And then we sat and relaxed for a while. We headed to Wisconsin Dells to see the movie, "Chef" (recommended by Becky) but it was no longer showing there. We decided to see "The Identical" instead and we both were glad that we decided on that one. It was a story of twins that were separated at birth and how their lives intertwined through the years, and how one of them struggled between the path his father wanted him to take or his own musical interests. To top off the day, we went to Cimarolli's for an Old Fashioned and Fish Fry. Great day!